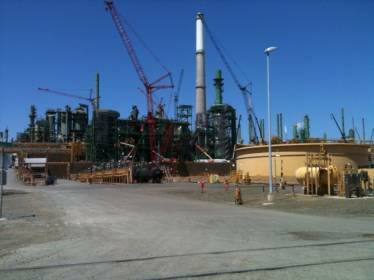 The Benicia refinery in California, owned by Valero Energy Corporation, was originally built in 1968 and purchased by Valero in 2000. The refinery underwent many additions and improvements that have led to it being a major supplier of clean burning automobile gasoline and asphalt into the California market. One such modification was the construction of a Flue Gas Scrubber to remove sulfur dioxide from the exhaust due to the refining process of converting crude and other unrefined materials into finished products. Portland Bolt supplied products ranging from ¾” diameter to huge 3½” diameter galvanized anchor bolts conforming to ASTM specifications A307, F1554 Grade 36, and F1554 Grade 105. All of the bolts were assembled with all hardware, marked for easy identification, and often included large custom plates. For more than one year, Portland Bolt supplied over 155,000 pounds of anchor bolts directly to the jobsite. Portland Bolt was able to meet the demanding concrete pour schedule with our in-house ability to hot-dip galvanize, as well as our capability to assemble, weld, and package per the customer’s approved drawings.